If you have decided that your facility would benefit from the addition of a guard booth then the next step is to get down to specifics. From size to style to additional features, there are a number of considerations you’ll need to take into account. In today’s blog, learn how to figure out what type of guard booth you’ll need. To choose the right guard booth, you’ll need to take many factors into consideration. Whether you need a small guard booth with only enough space for one security guard or you would like something roomier that can accommodate surveillance equipment and more, guard booths can be pre-fabricated in a large number of sizes. To determine the size you’ll need, you’ll need to consider the constraints of the location where your guard booth will be installed as well as its intended use. Working with an experienced guard booth manufacturer can help you determine the right size for your facility. Another consideration is the style of your guard booth. The exterior of your booth can be customized with optional features such as architectural moldings, roof styles, and 100+ colors to choose from. 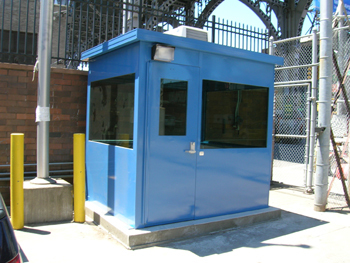 Your guard booth can be designed to complement the existing architecture of your facility or blend seamlessly with its surroundings. Once you have figured out the basics, you can start to plan the additional features you will need. If employees will be spending large amounts of time in your guard booth then the addition of an HVAC system will prove highly beneficial, as would the installation of a restroom. If your facility has a high security risk then you may want to consider a bullet resistant guard booth with tinted windows for additional safety. And no matter the type of facility you manage, the addition of flood lights will make your employees feel safer and more secure by making them more aware of their surroundings. At Shelters Direct, our prefabricated guard booths offer a wide range of additional features so that we can create the ideal booth for your needs. Contact us today to learn more about how we can help keep your facility safe and secure with the addition of a guard booth. This entry was posted on Thursday, April 21st, 2016	at 11:03 am	. You can follow any responses to this entry through the RSS 2.0	feed. Both comments and pings are currently closed.